There's nothing better than corn on the cob during the height of summer. In this warm-weather recipe, grilled sweet corn's flavors are heightened with a kicky mix of lime juice, mayonnaise and chili powder, inspired by the Mexican street food elote. Rubbing the corn with mayonnaise before it's grilled allows the sauce to permeate every kernel. 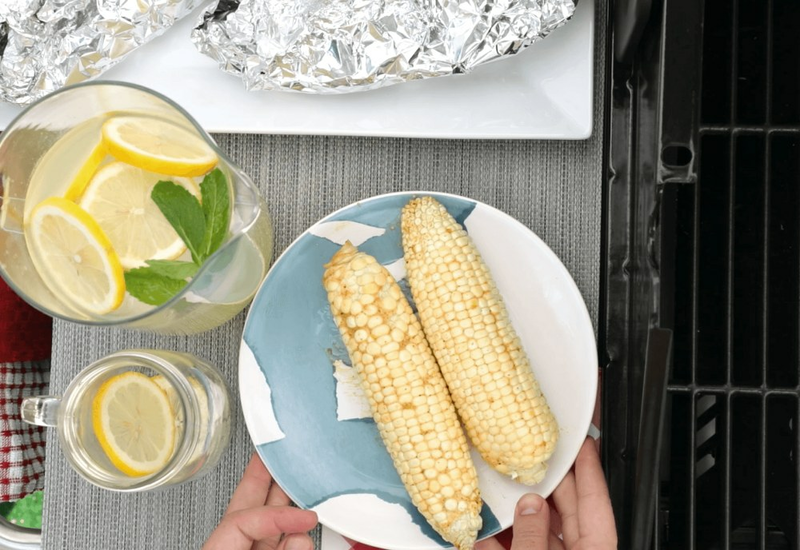 Keep the corn wrapped in aluminum foil after cooking for it to stay warm for up to 30 minutes. Serve this spicy side dish with grilled pork ribs or chicken thighs, or as an accompaniment to your favorite tacos. Sprinkle grated cheese and extra chili powder onto the grilled corn for an added kick! You can also serve this corn as a salad by cutting the kernels off of the cobs into a bowl. Top with crumbled cotija cheese and cilantro for a delicious side dish. Per Serving: 291 calories; 22g fat; 23.1g carbohydrates; 4g protein; 12mg cholesterol; 600mg sodium. We are big fans of corn on the cob in this house. May be unfair to compare this to the stuff we get at the roasted corn stand, but the chili powder didn't entirely work for us. Made a second batch with chipotle chili powder that was much tastier. Also dressed it with a little Parmesan cheese, because that is how we roll. Delicious. Full marks for the technique, but we wanted a little "more." I was skeptical that it would have that street corn taste to it but I was pleasantly surprised. I'd definitely make this again. also earns major points for how easy it is. Delicious! Chili and lime are the new salt and pepper! The mayonnaise reminds me of the Mexican street corn, so good. Street corn at home! I was also skeptical, since we usually do just grilled corn so it felt different to slather the corn. I topped it with a sprinkle of lime juice. This was so simple! I used to buy this chili lime seasoning from a fresh foods market, but when I moved I couldn't find it anywhere else. So bummed! This recipe is the closest thing I can get to it, and I'm obsessed. I add a little grated parmesan too. This is the best way to make corn, yummy!